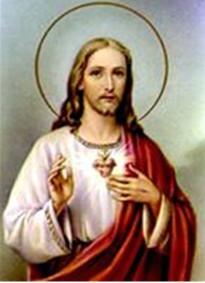 o sacred heart of jesus , filled with infinite love; broken by our ingratitude and pierced by our sins; yet loving us still; accept the consecration we make to Thee of all that we are and all that we have. Take every faculty of our souls and bodies, only day by day draw us nearer and nearer to Thy sacred Heart; and there as we shall hear the lesson, teach us Thy Holy Way. I will bless every place where a picture of my heart shall be exposed and honored. One of my favourite prayers, a prayer to be kepted in your house or by your side. Every Catholic should have this Catholic Sacred heart prayer in there house some were. If you don’t just print this page, then cut out the picture and prayer and put it in a small frame on the wall or on a shelf.